Why upgrade? Check out our feature list below, and we are always adding new ideas. Click the graph icon on your MY Results page. 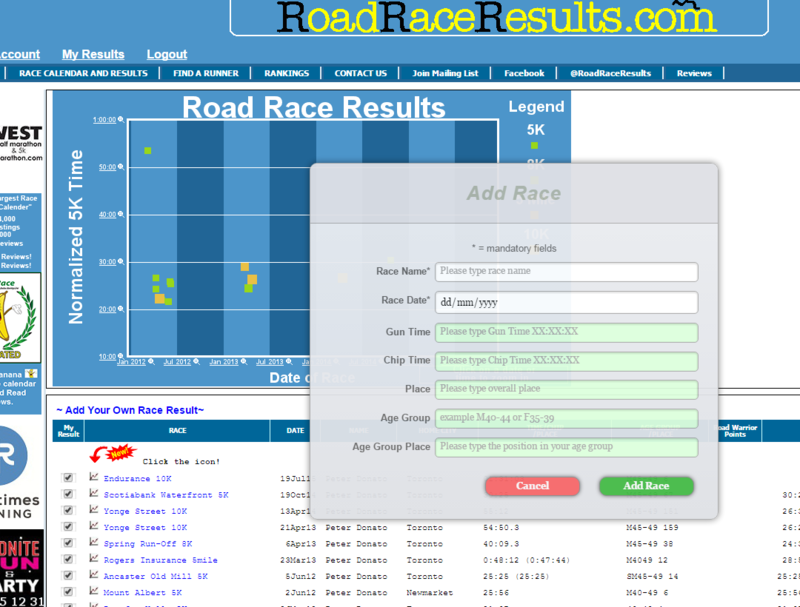 Female (Purple) are also indicated, so you can see how much to improve the next time you enter this race! not provided these statistics, so just assume it was you! if you are having fun with these statistics tell your friends about us! Start by looking up a runner in "Find A Runner". this "scalping". That's when you have finally caught your rival, passed him or her and finished ahead in a race! It does not even have to be someone you know, but someone you identify with as a future competitor. We think there could be a better name for this feature, so send in your suggestions and yours might get selected. Start by going to your "My Results" page. have to suspend your account and make you beg for mercy to get back in! What you CANNOT do in this new feature is delete any events in your profile. This feature highlights your personal best times in the 5K, 10K, Half Marathon, 30K and Marathon races. Simple but nice for you and your friends/rivals to be able to identify your PBs quickly.